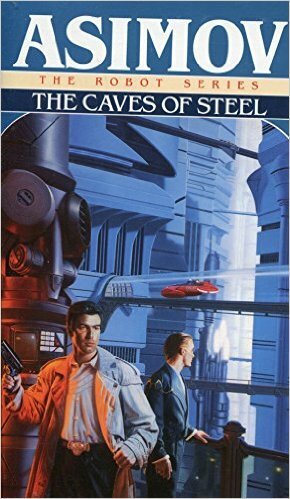 The Caves of Steel is really the first of Asimov’s robot novels, as I, Robot was short stories stitched together by a tiny framework narrative. In the introduction, Asimov relates that the conceit of the novel came out of a conversation with an editor: a science fiction mystery that didn’t use technology to cheat and come to a solution too readily. When it was published in 1954, it may very well have been the first science fiction mystery. 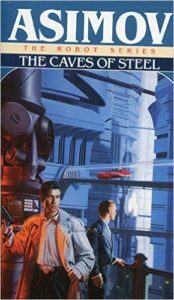 There’s a lot to like in The Caves of Steel, though more than 60 years after its publication it is also now more a part of history. The story concerns a human policeman and a robot partner trying to solve a murder in a far-future New York. Three thousand years in the future, the city is fully enclosed, and people spend their entire lives in the artificial environment of towers and rolling sidewalks (why did people think these would work?). Life is regimented, with space and food tightly controlled as Earth struggles to support a staggering population of 8 billion. Robots are increasingly replacing human labor, and people are unhappy but don’t know how to fight back. The protagonist, Lije Baley, is strongly but not violently anti-robot. He also fears for his job, as robots are even coming onto the police force. At first, I was annoyed with the book. Asimov has moved all of the story’s furniture into the distant future, but relations between the characters are still those of 1950s America with a smattering of collectivization laid on top. Coming up with a temporally distant human society that reads like a distinct thing takes considerable historical imagination, and Asimov doesn’t have it here. On the other hand, he was expanding the boundaries of the field as it existed at the time. Dated innovation is an odd thing. Then I thought about what was happening in America in 1954: the year of Brown v. Board of Education. Society around Asimov was being challenged to integrate a minority it had previously considered inferior, sub-human. The Caves of Steel might be something like an integration novel, from the point of view of a person whose unthinking segregationism is challenged by what he sees. Baley also makes his way to the place where the Spacers (humans who have colonized other star systems and established a return embassy on Earth) live, segregated from and feared by the rest of New York, and thus analogous to black neighborhoods in Asimov’s time, but also a place where humans and robots live in harmony, and thus a possible model of a new society. Baley, whose food in the city is all processed, is offered a real apple during his conference with the Spacers. He eats of the fruit of the tree of knowledge and … begins to change his mind. It’s not a Fall, but the beginning of a change. The integration story that I had envisioned halfway through the novel never really materializes. Instead, Asimov substitutes some hand-wavy social engineering that reminds me of what I dimly recall from his Foundation series, so I guess it’s all of a piece. The mystery gets solved, and it’s both reasonably clever and not a technological cheat, so that’s a plus for this book. The Caves of Steel stretched the genre for its time, but it’s also very much of its time. I have often made the observation that Asimov could envision a society in which jobs done by men could be done by robots, but he couldn’t envision a society in which jobs done by men could be done by women. I seem to recall that all of the female characters in this story were housewives, even 3000 years in the future. That is a very apt way to phrase it, and I agree wholeheartedly.